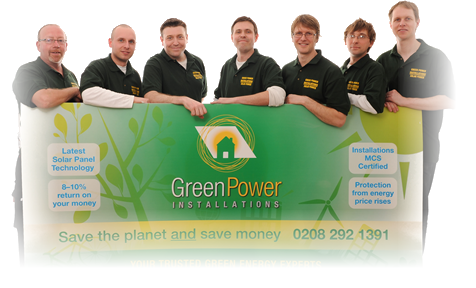 Green Power Installations is based in Muswell Hill, North London. Our clients live and work all over the UK. Our company was co-founded by brothers Edward and James Windsor in 2010 for two reasons. Firstly, they wanted to help reduce the amount of money their customers spent on energy. Secondly, they wanted to reduce the impact that energy usage had on the wider world. Edward and James started up their own construction firm 20 years ago, specialising in residential property. Their company, Urban Design Build has renovated and restored many home throughout London. They gained a clear insight into how much energy we use on things like heating and lighting. Then they got thinking about how much waste we all produce – particularly in the field of construction. From recycling waste, to minimising our use of paper – everyone at Green Power is committed to finding ever more sustainable ways of working. As you’d expect, our offices are powered by solar energy. Whenever we visit our clients, we travel by the ultra green, G-Wiz electric car, twice winner of the Best City Car award. In fact, we’re completely focused on a more holistic, more effective approach to working greener and smarter. Edward and James Windsor have handpicked a team of highly skilled solar panel experts, including in-house energy assessor specialists. Backed by industry marques, proven methods and cutting edge research, your solar panels will last for years into the future. It began with the idea of offsetting our carbon footprint by planting trees, and today, we’re still looking for new ways to reduce our impact on the environment. Learn all about our company’s ethos and service commitment – and how the way we work makes all the difference to our customers.